The "must have" addition to your wireless headset. The Plantronics Savi On-line Indicator (PN: 80287-01) is a valuable addition to your Savi wireless headset. It lets people know that you are on the phone, by providing a visual indication. 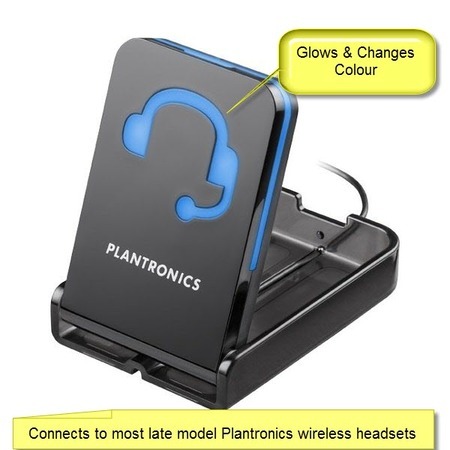 This model connects to Plantronics Savi series bases (W300 and W700 series) as well as CS500 series bases. Now, it also connects to a wide range of Plantronics Electronic Hook Switch Cables. This On-line Indicator can also be used with any HL10 handset lifter (both original HL10 and Savi HL10). It can even be used in place of the 65116-01 On-line indicator light when plugging into the original HL10 handset lifter. Avoid those annoying interruptions, while you are talking on your wireless headset. This online indicator dramatically reduces the volume of your interrupted phone calls. Your fellow employees know that you are talking "on the phone". Simply plug it in and the light comes on and pulses BLUE when you press your call control (i.e. answer) button.